Sophie Kahn's series Strange to inhabit the earth no longer comprises haunting imagery created by (mis)using sophisticated digital technology. Kahn's moving body confounds the 3D scanner she uses to capture it. 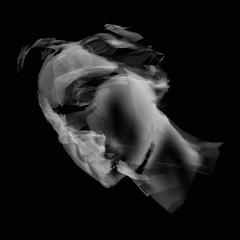 The images generated exist somewhere between portrait and x-ray, flesh and spirit. These fragmented yet beautiful bodies floating on black bring to mind the role of photography as memorial - the imperfect archive of the traces left by the body as it moves through time and space.